Posted on March 25, 2011 at 10:06. Our engineering group objected to posting pictures of such an early prototype, but we are really excited about our new keyboard design: the industrial 4-position folding keyboard. 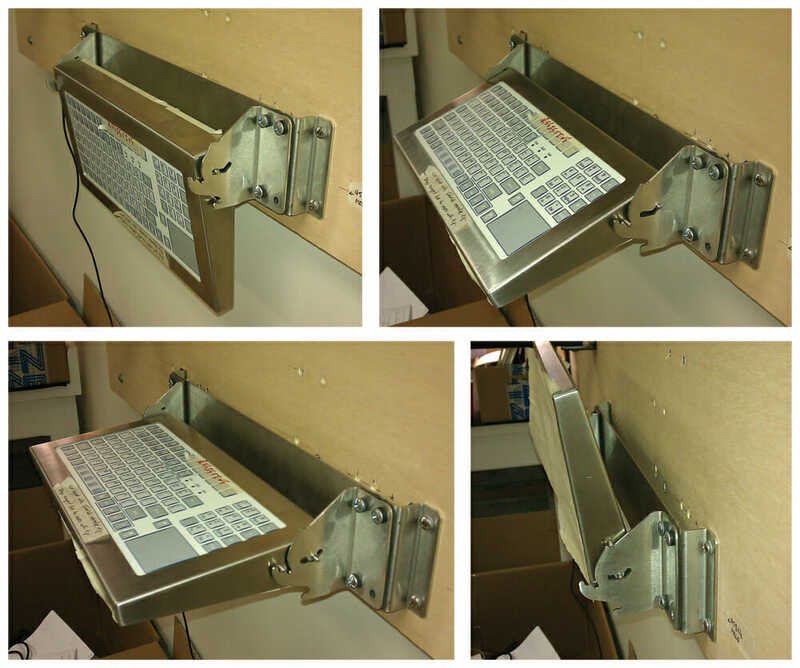 We have looked at our 45-degree panel mount keyboard design in previous blog posts. This is a popular product for our Panel Mount Monitor customers who want to add an additional keyboard and pointing device, usually under a panel-mounted display. This new product takes this idea one step further: the keyboard can be positioned in two different typing positions (to allow for comfortable use from people of varying heights), as well as two storage positions (up and down) that fold the keyboard to a low profile. We will have plenty of more information and specifications once this product completes development and testing, but for now enjoy these top-secret spy photos!